FLOWERY BRANCH, Ga. (AP) — Julio Jones seems to take pleasure in shutting down questions about his accomplishments. It comes to him as naturally as catching a pass over the middle and stiff-arming a defender for extra yards. 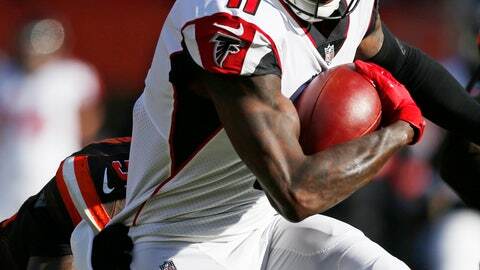 Jones, the Atlanta Falcons‘ star wideout, last week became the quickest player in NFL history to reach 10,000 yards receiving. He accomplished the feat in 104 games, easily breaking Calvin Johnson’s mark of 115. But Jones refuses to take much credit, pointing out that quarterback Matt Ryan, his teammate since the Falcons drafted him sixth overall in 2011, and many others played an equally big role. Falcons offensive coordinator Steve Sarkisian, in his second season working with Jones, has a pretty good idea why his big playmaker causes so many matchup problems even as he’s constantly double-teamed. Linebackers often aren’t fast enough to cover him. Defensive backs are often too small to tackle the 6-foot-3, 220-pounder. Jones is more concerned with helping the Falcons (4-5) beat Dallas (4-5) to stay in the NFC playoff hunt. The Cowboys‘ secondary has only two interceptions but is still a threat with cornerbacks Byron Jones, Chidobe Awuzie and safeties Jeff Heath and Xavier Woods having combined for 22 pass breakups. In last week’s loss at Cleveland, the Falcons couldn’t answer quickly enough when they trailed by 18 points midway through the third quarter. Knowing Atlanta was no longer a threat to run the ball, the Browns dropped back in coverage and kept everything in front of them. Jones wants the Falcons to establish the run early and maintain it throughout the game. Ryan needs the threat of play-action to keep the linebackers up and let his receivers get open for big gains. Notes: Thursday marked the first day that K Matt Bryant was listed as a full participant in practice since Week 6. Bryant, the career franchise scoring leader, has been sidelined with a sore hamstring. If he is able to play, the Falcons might release Giorgio Tavecchio to add depth at other positions. … MLB Deion Jones, returning from a foot injury that’s sidelined him since Week 1, was a limited participant for the second straight day. … Also limited were WR Mohamed Sanu (hip), S Damontae Kazee (shoulder), DE Derrick Shelby (groin), LBs De’Vondre Campbell (calf) and Bruce Carter (knee).